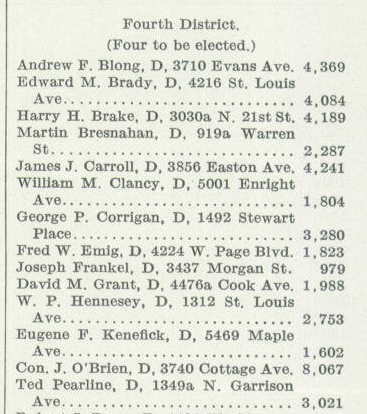 In honor of election day tomorrow, this week I transcribe some election results from a 1932 primary for State Representative in the fourth district of St. Louis. This comes from the Official Manual of the State of Missouri. 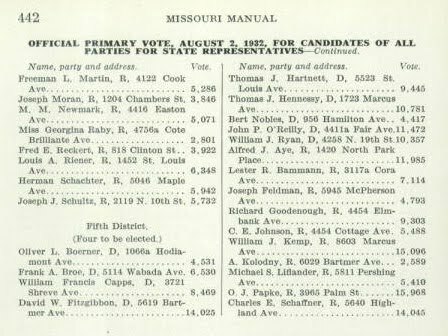 The volumes from 1878 to 2000 are online, and searchable, at Missouri Digital Heritage. Pardon me as I also praise the Secretary of State who oversaw the creation of Missouri Digital Heritage - Robin Carnahan. It is my fervent hope she earns a seat in the Senate tomorrow, but she has already left quite a legacy here in Missouri. 1) The top four vote getters in both parties proceeded to the general election. M.M. 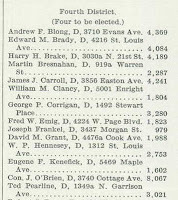 Newmark came in seventh in the Republican vote. 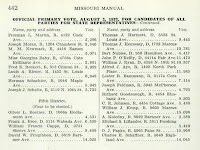 2) This was most likely Maurice M. Newmark (1906-1949), a first cousin of my paternal grandfather. Maurice was the son of Solomon and Sarah (Nathan) Newmark, whose marriage I mentioned in yesterday's post. Maurice's death certificate confirms his middle initial was 'M', and there are no other likely candidates. 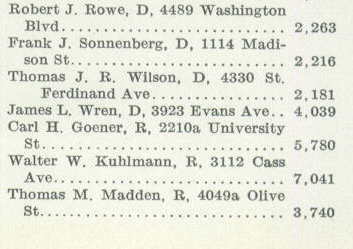 I hope to verify his 1932 address in the city directories on a future trip to the local library.